THE HELICOPTER SERVICE from Phuket Airport to Six senses Yao Noi , which offers the ultimate arrival experience, has now become more affordable. The helicopter alternative cuts almost three-quarters of the total transfer time off the speedboat transfer. Within 15 minutes of clearing arrival formalities at Phuket Airport, guests can be airborne on their direct helicopter flight to the resort on Yao Noi Island, for 11,250 THB per person, or approximately US $375 – two-thirds off the original fare. Additional passengers travelling in the same group on the same flight will have an even greater savings. It’s a once-in-a-lifetime opportunity that provides guests a bird’s eye view of Phang Nga’s National Geographic world heritage classified dramatic limestone formations and islets, as well as James Bond Island – filming location for the classic Bond movie, Man With The Golden Gun. At Phuket Airport, guests will be chauffeur-driven to the helipad to board a luxury Advance Aviation “Golden Eagle” Eurocopter EC – 130 helicopter, with plush leather seats, air conditioning and room for up to six passengers. Luggage will be taken care by the ground staff. Within minutes of lift-off from the beautifully lush green island of Phuket, with rubber plantations and rice fields, the flight approaches Phang Nga Bay, often referred to as the most spectacular Bay in South East Asia. Just several minutes later, it touches down on Six Senses Yao Noi’s private helipad, where guests will be met by their butler and whisked to their private pool villa. Maximum number of people per flight is six. Additional passengers travelling in the same group with the same booking, will be charged at 5,000 THB per person. The offer is valid only for the travel period June 1 – Oct. 31, 2013. The helicopter operates from Phuket Airport, and during daylight hours only. Guests will be met on arrival at the airport and transferred to the helicopter waiting-lounge. The helicopter transfer will take approximately fifteen minutes. 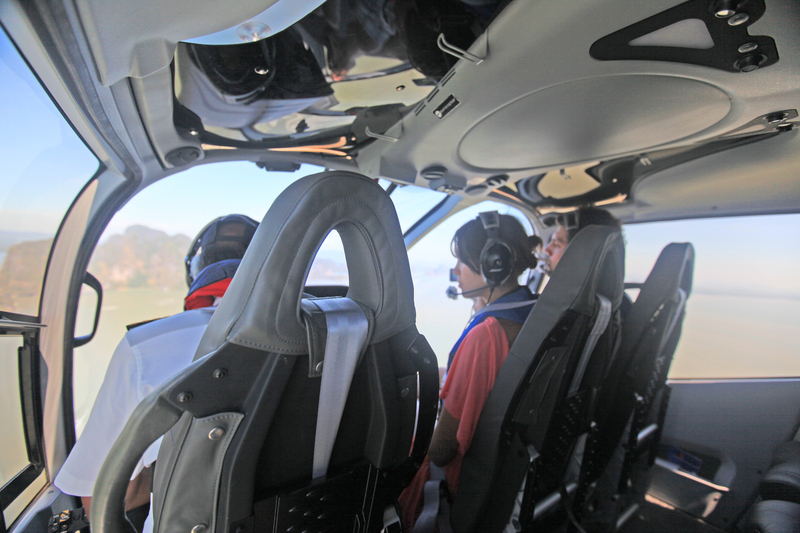 The helicopter has space for a maximum of six passengers and luggage allowance per guest is 16kg.